The Omega Model 8003 (White) Nutrition Center is our new single gear, masticating juice extractor that will serve all of your juicing needs and much more. This unit is truly a “multiple use” appliance. While most appliances that are built for more than one use tend to compromise one task for another, the Omega Model 8003 Nutrition Center excels at all of its functions. Our single gear machine turns at a low 80 RPMs to ensure that nothing is lost through heated elements in your juice, keeping those valuable antioxidants alive for maximum detoxification. 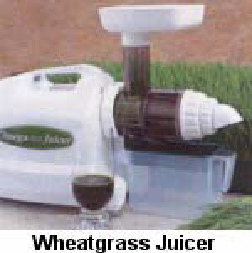 This low speed also helps the Omega 8003 foam less when juicing leafy greens. The Omega 8003 Juicer efficiently juices hard and soft fruits: even citrus fruits, usually one of the hardest fruits to juice. The Omega 8003 Juicer juices all kinds of vegetables including carrots, beets, celery, peppers, and radishes without destroying the natural flavor and nutritional benefits. Fresh taste and full nutrition are guaranteed with this unique extraction process. Wheat grasses, kale, cabbage, spinach, and pine tree needles are just some of the natural products that can be juiced with the Omega Juicer 8003 Nutrition Center. 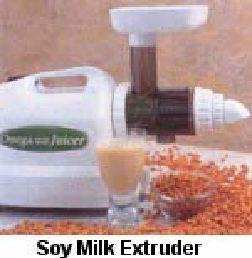 Enjoy the best that nature offers in raw foods of all kinds and juice them for full nutritional benefits. The Omega 8003 chops and minces, providing natural flavor and nutrition from garlic, scallions, red pepper, ginger, and most other foods, including herbs and seasonings. 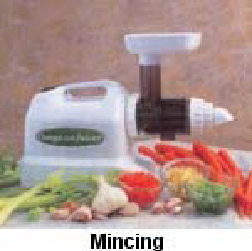 Soft foods for special diets, babies and geriatric patients are quick and easy to prepare with the mincing set-up. 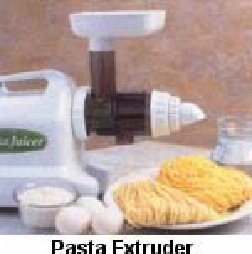 Homemade spaghetti, linguini or breadsticks can be extruded in just minutes with the included pasta nozzles. 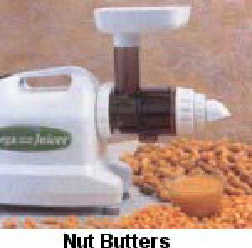 Make fresh frozen desserts, natural baby food and nut butters using your fresh fruit and vegetables. NOTE: The Omega 8005 (Crome) Juicer and the Omega 8003 (White) Juicer are identical in performance and features. The only difference is color. • Low Rotation Speed of 80 RPMs. 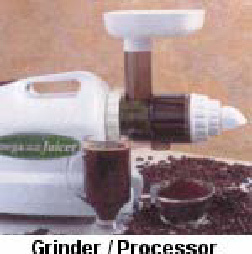 Powerful motor chews the plant fibers and - penetrates membrane to extract vitamins, enzymes, and mineral content. • Heavy Duty Construction using the highest quality materials. • Built in "reverse" prevents clogging. • User Friendly. Easy to assemble, operate and dissasemble for quick cleaning. • No separate attachments needed. • Full 10 year Warranty. Household and commercial use!